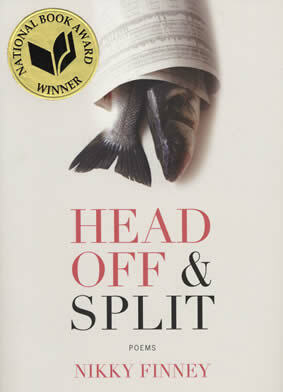 This spring, University of North Carolina Wilmington’s Department of Creative Writing hosted visiting writer Nikky Finney, distinguished South Carolinian writer and teacher, whose fourth collection, Head Off & Split, was awarded the 2011 National Book Award for poetry. Before coming to UNCW I didn’t seek out poetry, but since beginning my MFA here last fall, and working as a TA for the Pub Lab, I’ve been inundated with poems. As a fiction writer, one prone to writing concise vignettes and flash fiction, I’m fascinated by the distinction between poetry and prose. I attended Nikky Finney’s public reading on Thursday, April 21, eager to hear her experience with words and form. The Kenan Hall room was packed with faculty, students, and Wilmingtonians, and I found a seat on the floor in the back, where I could only see the poet when a sea of shoulders in front of me shifted just so. But I could hear her speak, and between poems Nikky Finney offered habits that improve her writing, told anecdotes about her family and how they’ve influenced her work, and shared her deep connection to the beach. She spoke with such authority, intimacy, and openness I couldn’t resist scrawling down quotes in my notebook. 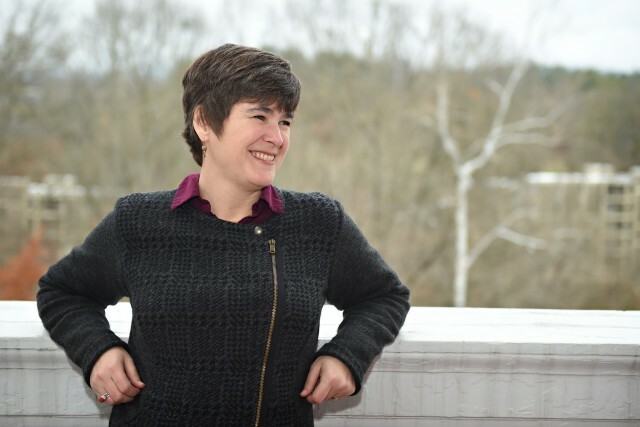 I left the reading, perhaps just as muddled about the distinction of prose and poems, but armed with two of her books, the desire to get home to my writing desk as quickly as possible, and the intention to connect more deeply with the quiet places Wilmington offers writers. I’m excited to share her words and ideas that have already begun to nourish me, with our readers. 4) Keep an epigraph journal. 5) Talk about hard things in a loving way. 9) Face the thing you really need to be looking at. 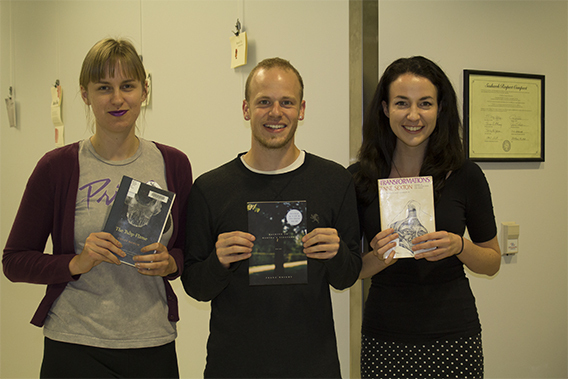 In honor of the MFA students graduating from our program at UNCW this semester, and because we think National Poetry Month should be every month of the year, we found four graduating poets and one professor to share the poetry collections sitting on their bedside tables. What we discovered is a delightful array of poetic bounty that is sure to help inspire through the long days of summer–or life in the “real” world. I’m reading Ron Rash’s New and Selected Poems alongside The World Made Straight. I’ve become obsessed with his North Carolina/ Appalachian lexicon and how his masterful prose lines sometimes read like poetry. I’m beginning to see that he operates much like Carver in that some of his narrative poems reincarnate in his novels, and I’m always a sucker for genre-stealing/genre-complicating. Up next is Above the Waterfall, which I hear is even more lyrical. At this rate, I wouldn’t be surprised if I read him outright by summer’s end. I’m currently reading Chloe Honum’s poetry collection The Tulip-Flame. Initially, I picked the book up because it was chosen by one of my favorite poets, Tracy K. Smith, for a first book award. The Tulip-Flame includes different narrative strands with thematic connections: a mother’s suicide, a failed romantic relationship, the art and practice of ballet, and the growth, decay, and resurgence of a garden. These poems are stark, short, and gorgeous. They are both emotionally restrained and deeply moving. Not too long ago, I heard a writer tell an audience that writers should read outside of their comfort zone, by which s/he meant reading the kind of poems, stories, novels, etc., that you do not write yourself. I’m reading outside of my comfort zone by reading The Tulip-Flame, and it’s an inspiring and pleasurable experience. Walking to Martha’s Vineyard, by Franz Wright, was one of those books I’d been told to read about a half dozen times, but had never gotten around to. The poems are brief and clear. You can read them very quickly—they have that kind of accessibility, which generates interest in what comes next. Moving back through them it became clear that they work just as well if you take each poem slowly and seriously. I remember a professor once saying, of some poem we’d read, that it was unimposing in its artfulness. I thought of that often reading this book. I think it’s the kind of work most poets would really love to be able to generate. I first heard about Anne Sexton’s Transformations via Pernille Smith Larson, one of my MFA classmates. I had been working on a fairy tale series, and the collection was mentioned as a good potential reference for inspiration. Transformations is striking in that it haunts and at the same time manages humor. It retells old Grimm fairy tales while also redefining and refining them into modern poetry. Sexton accomplishes this in part through her use of more modern diction and imagery. 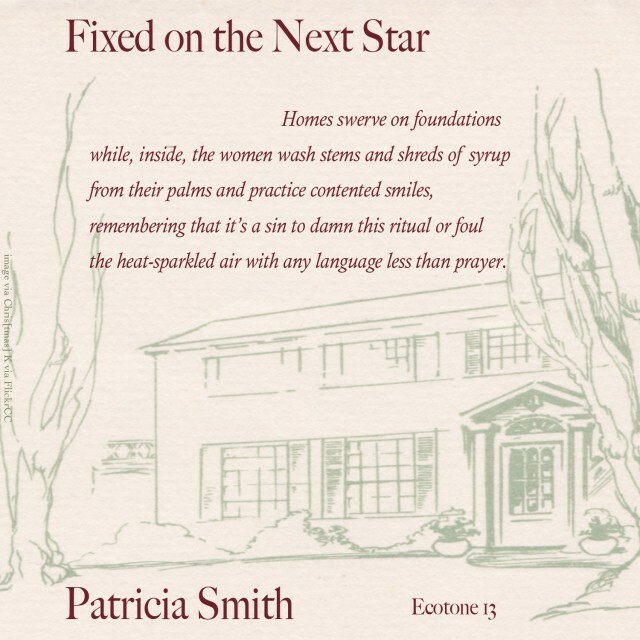 Prior to reading this, I had also read a handful of Sexton’s most famous poems, “The Starry Night” and “Her Kind” come to mind, as well as her award winning collection Live or Die. Transformations lived up to and has exceeded my expectations as a collection. It manages to breathe new life and adult themes into stories that have been around for centuries–stories that we’ve known in some version since we were children. I would really recommend this book to anyone interested in fairy tale lore or anyone who is a fan of Sexton’s other works. Especially if you are inclined—as I am—toward weaving fairy tale imagery and concepts or themes into your work. I have two very different books next to my reading chair. One is just out from Emily Carr, a former student and UNCW alum: Whosoever Has Let A Minotaur Enter Them, Or A Sonnet— from McSweeney’s Poetry Series. It is bold, fresh, fractured and surprising, trying to approach emotion through language in new ways. The other is Tugs in the Fog, selected poems by Joan Margarit, the Catalan poet. Margarit has written some beautiful, direct poems about ageing, grief, and memory. I find myself moved by both books, in different ways. As lovers of poetry and literary crusaders against pollution, we were so interested to hear about this new project, Poetry for Trash. 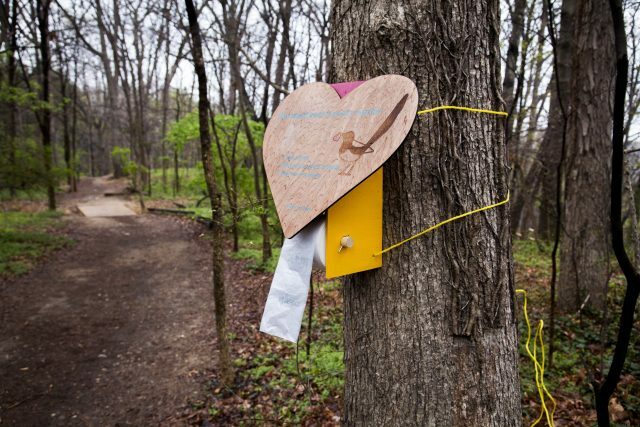 We asked founder and director John-Michael Peter Bloomquist to tell us about the project, his inspiration, and what poetry and trash have in common. Here’s what he had to say. As a poet, I’ve often asked myself the question: is poetry worth pursuing? Will this poem ever get published? Is this poem trash? Many poets and myself desire to write something valuable, which can be a good thing, depending on what we mean by valuable. I value poems that make me feel beautiful, loved, or less alone. More poetry is being written, published, and read than ever before, which is absolutely, unquestionably, unequivocally good. But I’ve become concerned that, instead of a desire to write, many of us are feeling pressure to write poems that sell—or at least that garner accolades and acclaim, earning us, for example, an esteemed teaching position that supports us financially. Poetry is also now, more than ever before, moving closer to becoming a commodity. Am I the only one guilty of asking: How much money will this poem make? Will it earn an award? Will it get me that job? Consumerism has infiltrated our poetics, and though there is a cause for despair when corporations and fashion chains look for poets to endorse them, I believe that the economy of poetry can help save us and our planet. The scourge of a consumerist culture is pollution. Use it up, throw it out. Right now I live in Richmond, Virginia, and when I walk by the James River, I’m dumbfounded by how many bottles, cans, wrappers, and cigarettes I find. Everyone with a heart is concerned about the environment and pollution. And so another one of my questions has been: what makes an ecological poem? What is its subject matter, its line breaks, its diction, and should it be printed on recycled paper or should it be published online? Poetry functions within the gift economy. Mauss, author of the seminal book on gift economies, The Gift, said that there are three obligations within the gift economy: to give, to receive, and to reciprocate. Nature gives us the food, water, and air we need to survive, but instead of reciprocating, we’ve been making capital and consuming. While a poem doesn’t (or at least shouldn’t) make capital, it does ask us to reciprocate, not just to read and write more poems, but to love more. And this is why I see all poetry as ecological. Through these stations two dumpsters worth of trash have been picked up and thousands of poems have been given away. Poetry is a solution to pollution because purification starts in the heart. 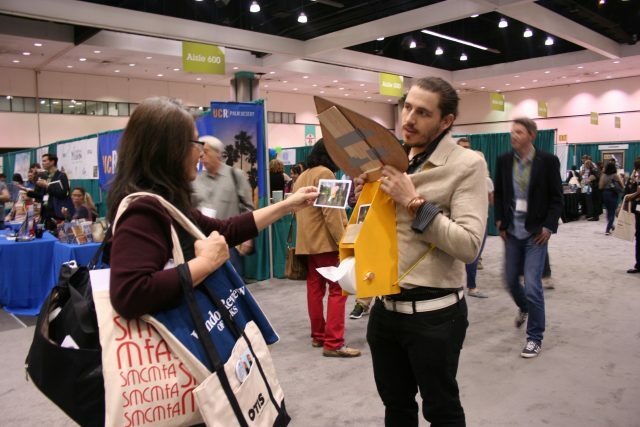 We were at AWP this year, at the Virginia Commonwealth University booth, modeling the new sign and giving away postcards that you can mail to your loved ones, which feature poems by some of our favorite contemporary poets in the country. Check out the work that we’ve been doing at poetryfortrash.com. Let’s keep the planet clean and our poetry free. The staff of Ecotone and Lookout wish you and your loved ones the happiest of holiday seasons! 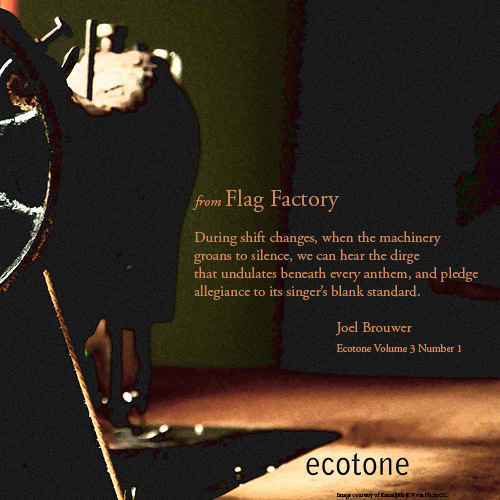 Lesley Wheeler’s poem “Grant Report, New Zealand” appears in Ecotone’s Migration Issue, and her entry in our Poem in a Landscape department appears in Ecotone 19, our tenth-anniversary issue. 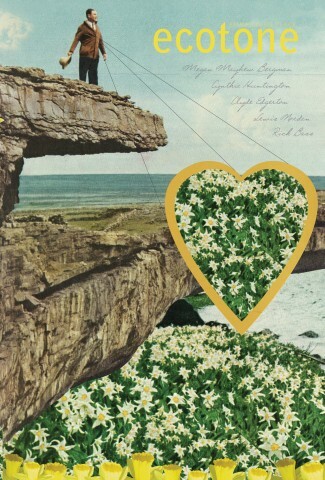 Radioland, her fourth collection of poems, is newly out from Barrow Street Press. Editing a book of poetry is probably not on most people’s list of terrors, but I’d rather face public speaking any day, or maybe an egg sac bursting with baby wood spiders. You’ve been web-spinning for years and the results are almost ready for the public, but first you have to make sure the spacing and em dashes are just so. And that’s the easy part: it’s much harder to read your poems freshly again and again during the brief window your overworked editors allot for the process. If you don’t, however, you won’t catch the word whorl on three pages running, or a slightly bungled Dickinson quote, or the dropped italics. Then one day when, overcoming the existential nausea of book promotion, you stand at podium before those raised expectant faces, you’ll turn to page seventeen and the error you finally spot will break your heart. Well, maybe you wouldn’t burn in shame about an em dash, but certain slips are more dreadful. While combing through Radioland, I worried particularly about my references to New Zealand. I spent several months in Aotearoa in 2011, and since then I’ve been negotiating my right to write about it: living there remapped the world for me, but I feared exoticizing the islands’ green cliffs and wild shorelines, skimming over pretty surfaces like a tourist. I quadruple-checked diacritical marks in Maori words, as well as facts about the 2011 earthquake. Differences between New Zealand and U.S. English also created quandaries. Maori would take a macron over the a in many contexts, for instance, but it doesn’t in Merriam-Webster’s Dictionary, the reference my press uses to settle spelling ambiguities. One poem triggered copyediting marks with a reference to “the mad jangling / of tui in the punga.” Tui, the name of an extraordinary New Zealand bird, which can be seen and heard in the New Zealand encyclopedia Te Ara, appears in U.S. dictionaries, but punga does not and therefore must be italicized. The contrasting fonts looked distracting, plus I realized how difficult punga would be for an American reader to look up, so I ended up changing the latter to “tree ferns” (fortunately metrically similar). Cultural respect, levels of correctness, confusion for readers, elegance on the page—they’re tricky to balance. 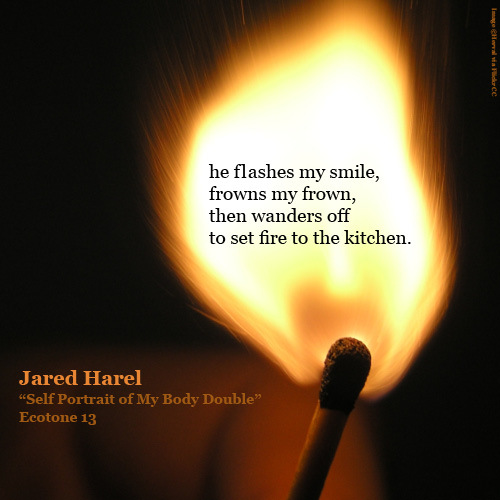 In celebration of Jared Harel receiving the Stanley Kunitz Memorial Prize for 2015 from the American Poetry Review, a broadside based on his poem, “Self Portrait of My Body Double” from Ecotone 13. 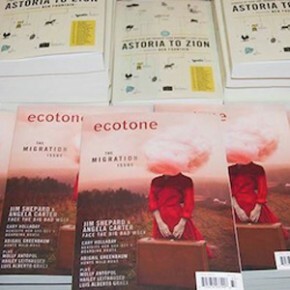 Ecotone’s tagline is “reimagining place,” and we love work that brings us to a specific location, real or imagined. 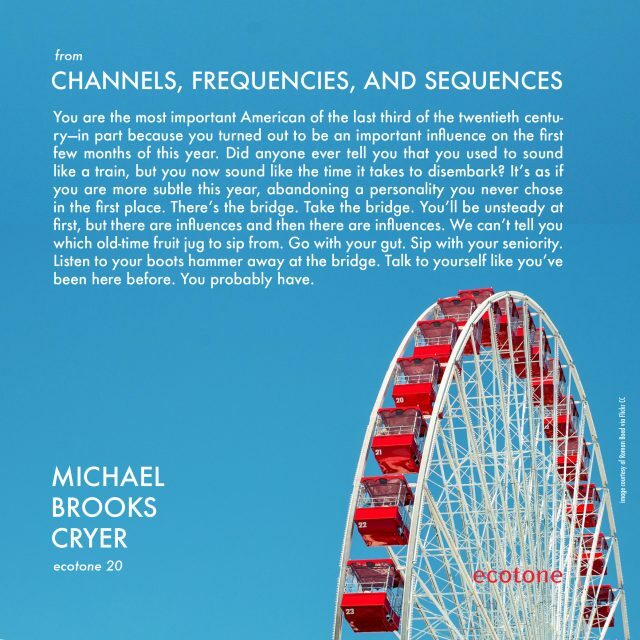 In this new department, Save Your Place, we’ll highlight our favorite descriptions of place from work we’ve published at Ecotone and Lookout. This is from Cynthia Huntington’s poem “Boletes in September” from Ecotone 15.